This month at the Boy’s Store we want to highlight Hank Player. Hank Player is a great great brand featured at our store that is made in the USA and creates incredible novelty tees for the whole family. We are proud to offer their boys clothing line with the superbly soft tees that are so cool your boys will love to wear them everyday. The vintage look and super soft feel makes them a favorite amongst boys who are looking for comfort over style, but still like style to play a factor in their look. Hank Player even has the official license of NASA, Smokey the Bear, and Woodsy Owl. So if you and your boys are looking for some great new tees that feature some fun and stylish quotes, images, and ideas look no further than Hank Player. You can check them out on The Boy’s Store Website now. 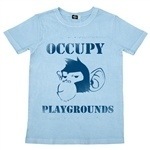 Occupy Playgrounds Shirt by Hank Player: this light blue tee is incredibly cool, and has a powerful yet sly slogan front and center. While the “Occupy” movement may. Mean little to a young boy he would probably love to occupy playgrounds. This ironic tee is not only adorable it is soft and comfortable to wear. Everyone will love its sly slogan when they see your boys sporting it around the playground. 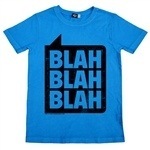 Blah Blah Blah by Hank Player: this bright blue tee features the perfect slogan for any young boy. “Blah, blah, blah.” It seems to be on the lips of most young boys, especially when dealing with parents or teachers that are trying to discipline them or teach them something. The ironic slogan will make adults laugh, and provide some much needed comic relief. 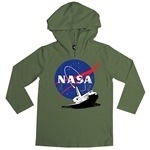 NASA Space Shuttle Endeavor Shirt by Hank Player: This olive green hoodie-tee will soon be a favorite amongst boys. It features the recently decommissioned Space Shuttle Endeavor which was seen last October as it made its way across the country from Cape Canaveral in Florida to Los Angeles, California. It is now housed in the California Science Center and can be visited by people everyday. Keep your son cool and in the know with this incredible commemorative hoodie-tee. Wo knows it may even create an interest in science and you may have a future scientist or explorer in your house. This entry was posted in boys clothing, Brand News, Featured item, Made in the USA and tagged boys clothes, boys tees, Brand feature, hank player, tees, the boys store on March 29, 2013 by Lacy.